Dean Willie Reed places a 50th Anniversary Class medallion on Dr. Mary Beth Leininger, past-president of the American Veterinary Medical Association, during the Meet Me @ the Mixer reception in the Purdue Memorial Union North Ballroom. Purdue University College of Veterinary Medicine faculty, staff, alumni, and friends gathered in the Purdue Memorial Union North Ballroom Thursday evening, September 20, during the Purdue Veterinary Conference's Meet Me @ the Mixer reception to recognize alumni celebrating class anniversaries. While sampling hors d'oeuvres, attendees enjoyed catching up with their classmates from years past. During the event, Dean Willie Reed announced each class anniversary year and then paid special tribute to the 25th and 50th reunion classes. 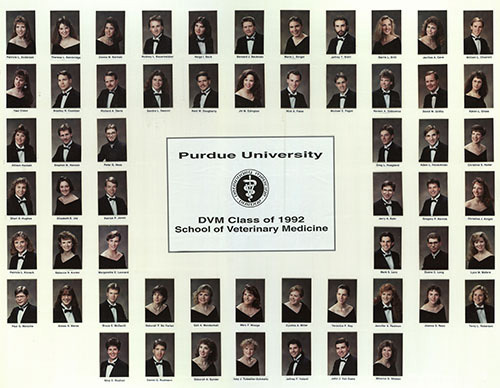 Dr. Jeff Valenti, of the DVM Class of 1992, spoke on behalf of his classmates on the occasion of their Silver Class Anniversary. "When I initially took steps to contact our classmates about our reunion, I was struck by how fast 25 years have gone by," Dr. Valenti said. "I think times like this one are very special. 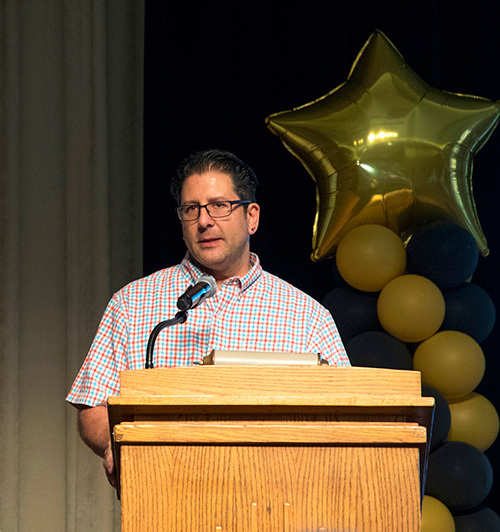 It's a time to see old friends, to reconnect with those we may not have seen since graduation, and it reminds us of the special times we shared together at Purdue." Dr. Valenti added, "As I get older, I realize that events like this are irreplaceable. There are a lot of things in life that you can say you think are important, but in the end, the chance to get to see people you have spent a lot of time with and that you care about, that's incredible." 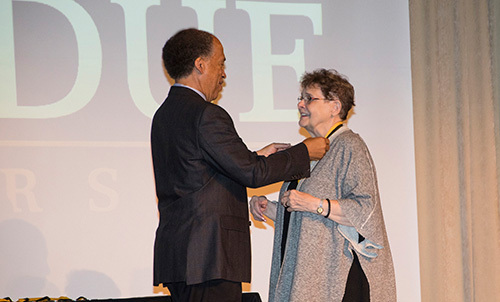 Members of the 50th Anniversary Class, the Class of 1967, also were honored as they were introduced individually by PVM Director of Alumni Relations Susan Xioufaridou, before they each received a special 50th Anniversary Class medallion from the Purdue Veterinary Alumni Association. Dr. Robert Jackman, class member and former state senator, shared reflections on behalf of his classmates, recalling that there were 48 when they graduated June 6, 1967. "We became a very close family," Dr. Jackman said. "We studied hard and we played hard. We had a good time." Dr. Jackman also recounted his classmates' accomplishments. "We have an AVMA president, we have professors at different universities all over the world…researchers all around the world, and even had a guy who rode a bicycle around the world. What we got from Purdue University was a foundation. Our education laid the foundation for us to succeed." The evening concluded with the opportunity for the reunion class members to get class pictures. Click here to view photos of the event taken by photographer Ed Lausch. At the login page, use the username "2017mixer" and the password "september2017". Thank you to everyone in attendance who helped to make this year's Mixer fun and memorable for all! Dr. Jeff Valenti, of Plainfield, Ill., speaks on behalf of his classmates in the 25th Anniversary Class at the Meet Me @ the Mixer reception. 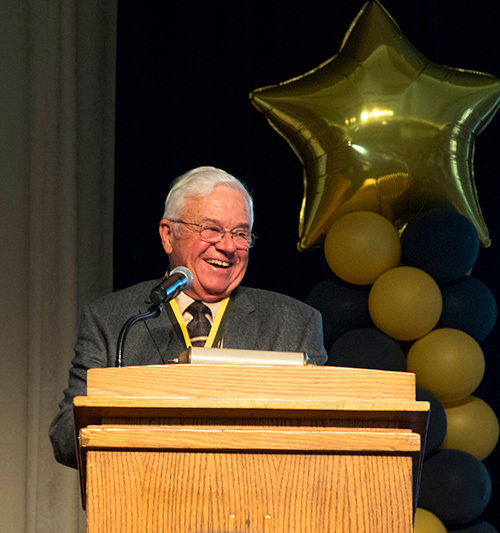 Dr. Bob Jackman, former state senator from Milroy, Ind., shared several funny stories as he spoke on behalf of his class, the Golden Anniversary Class of 1967.